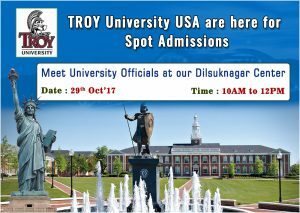 Spot Admissions to TROY University. Troy University, was founded on February 26, 1887, as Troy State Normal School within the Alabama State University. Most important: The university has deadlines up to 16th November. Admission for Spring 2018 intake is highly recommended. The scholarship opportunities at Troy are plenty. Eligibility is based on GPA requirement or country location, including ability in essay writing and interest in the particular study program. A graduation that will direct your career to fulfill your passion. A wide range of graduate and undergraduate scholarships are found on the campus, even through online. To know them, browse the resources listings, which is on the left in drop-down menus. Review the scholarships available at Troy. A student can make good use of them for achieving career dreams. A minimum gathering of 100 students is expected. There is enrolment offered to average students as per their need. Spot registration in Bachelors and Master’s graduation for student’s with certificates is guaranteed. Tuition fees are very low: $ 15,500 approximately per year. Living expenses extra.